Sunnyslope Church of God in Christ, Mennonite. 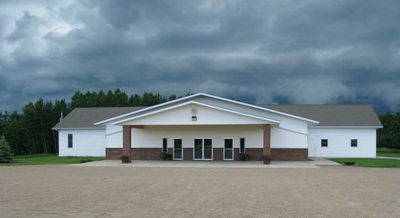 The Sunnyslope Church of God in Christ, Mennonite congregation at Linden, Alberta completed a building program in 1995. The congregation began as a daughter congregation of the Linden Church of God in Christ, Mennonite. Ministers Gary Klassen and Henry Enns served in 2010 as a congregational leaders. The congregation operates the Kneehill Christian School together with the Linden Church of God in Christ, Mennonite and the Swalwell Country Church. Location: 7 km north of Linden on Hwy. 806 and 3 km west on Hwy. 582. Steiner, Sam. "Sunnyslope Church of God in Christ, Mennonite (Linden, Alberta, Canada)." Global Anabaptist Mennonite Encyclopedia Online. July 2011. Web. 20 Apr 2019. http://gameo.org/index.php?title=Sunnyslope_Church_of_God_in_Christ,_Mennonite_(Linden,_Alberta,_Canada)&oldid=116593. Steiner, Sam. (July 2011). Sunnyslope Church of God in Christ, Mennonite (Linden, Alberta, Canada). Global Anabaptist Mennonite Encyclopedia Online. Retrieved 20 April 2019, from http://gameo.org/index.php?title=Sunnyslope_Church_of_God_in_Christ,_Mennonite_(Linden,_Alberta,_Canada)&oldid=116593. This page was last modified on 24 March 2014, at 06:14.